There is nothing better than the awesome aroma of bacon being cooked at home. The smoke alarm goes off almost every time we make bacon. We love bacon at this household. We cook it at least twice a week. Bacon is a very common ingredient in several of our dishes. Some may think bacon is very easy to cook, but there’s really quite a science to perfecting bacon. First, your bacon selection is key. It’s ok to be picky about your bacon. I’ve learned it’s worth paying a little extra money for good quality bacon. Recently, we’ve become fans of the Farmers Applewood Bacon sold at Costco. It’s a great choice for bacon in the oven because it’s a thicker cut. Secondly, how you cook your bacon is super important as well. For years, I cooked it on the stove top which I still enjoy. Of course, I’ve used the quick and easy microwave at times too, but it fails to get crisp. Most recently my husband has been cooking our bacon in the oven on a broiler pan. It’s amazingly delicious, crisp, and close to perfection. Bacon in the oven is super easy with less mess. Check it out! 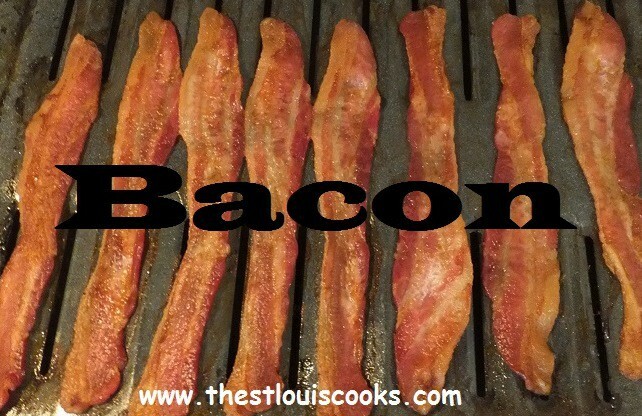 Bacon – any kind of your choice – thicker cut works best for the oven. Set the oven to 450 degrees. While the oven is preheating, arrange slices next to each other on a broiler pan. Cook the bacon in the preheated oven for 12-16 minutes. The time depends on whether you have a thicker cut of bacon or how crisp you like your bacon. Keep a close eye on it so it’s cooked to your liking.